IKEA might be known for soulless furniture basics, but in the year 2040 they're planning on selling mood-adjusting kitchenware, and fridges that project celebrity chefs' cooking tutorials. In short, it doesn't sound all that far-fetched. The "SKARP" concept as it's been dubbed, was designed after close to 2,000 people were surveyed on what they expect kitchens to look like in 2040. I'm not so sure about their idea that this kitchen will have sixth-generation iPads in every cabinet door, but the 3D food printing is certainly something we know is on its way. 1.) Food is grown on this shelf without soil. 3.) 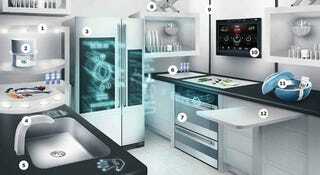 Fridge, with an interactive 3D screen. 12.) Roll-out chopping boards and draws. Really, 2040? Most of this technology is already available, or at the very least, entirely possible. Nonetheless, I'd give up eating cheese for a kitchen that tidy and organized.